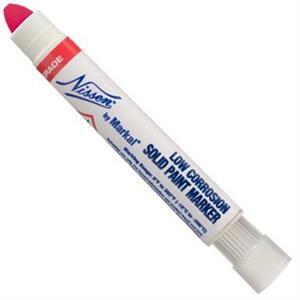 Use Nissen low chloride solid marker for permanent marks on stainless steel and other super alloys requiring low chloride. Will not corrode or effect stainless steel. Fast drying formula, solid paint marker, marking range -50 to 150 F. Nissen low chloride solid paint marker is ideal for marking in nuclear, military, oil and gas, welding, automotive and constructions.